Striata, a specialist in secure customer communications management is once again a sponsor of the Billentis report. “This year, the report is a 150 page + tome of facts and figures. It’s also the bible in terms of the developments and trends in the eInvoicing and eBilling world in lieu of anything else,” says Michael Wright, CEO, Striata. What’s changed in the last year that brings with it the hint of a ‘quantum leap’? The buzzwords for 2015 are ‘Zero-touch’ and ‘Tax Compliance’, with each of these having vastly different constituent bases and drivers. “The report covers a few areas of interest; the accuracy of ’Big data’ as a critical step to success, eInvoicing now going mobile, but the clear winner is the emergence of data enhanced PDF documents emailed to customers as the defacto standard for 99% of billers,” says Wright. The next frontier for the entire ecosystem is “Invoice-like documents and messages,” including overdue notifications, payslips, receipts and till slips. It is estimated that these volumes are 5-15 times the invoice volume. Wright believes that this could be an enormous driver in the growth of paperless processes. Tax compliance with special focus on VAT reclaim documents (mostly in Europe) is a growing trend in the market. Government’s fiscal departments are mandating the use of electronic invoicing as a way of gathering the data about taxable receipts in real-time, this in conjunction with the supply of goods and services. These can then be compared at a later stage with the actual declarations and taxes paid. Latin America leads the way in this regard, with most countries requiring the registration of an invoice in a national database. Last year, approximately 5 billion invoices were electronically exchanged in Mexico. Wright highlights the fact that in Europe, the Nordic countries have traditionally led the way – but says, with new EU directives in place all European Public Administration entities will be obliged to support a certain eInvoicing standard for the automated exchange of electronic invoices. 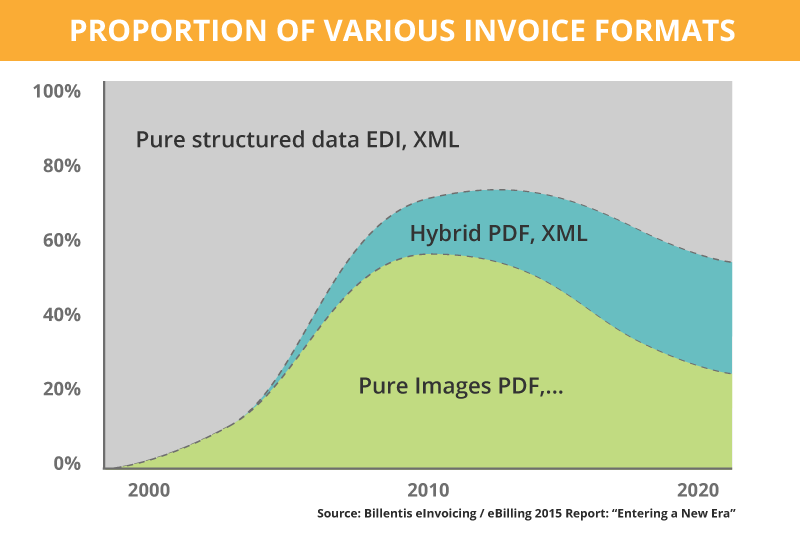 “In this regard, PDF (including those enhanced with XML data) now accounts for 3/4 of all electronic invoices in Europe. The ‘PUSH’ methodology is now the most popular process,” says Wright. For the first time ‘Mobile’ has attention. The eInvoicing requirements do not lend themselves to an ‘app’, however we can see value in updates and notifications being sent via mobile channels for B2B and payments and reminders for B2C. The value of invoice data in an increasingly ‘Big Data’ world is also a key finding in this year’s report. The insights into customer payment behaviour and the use of predictive analytics are becoming an opportunity in the process for large billers. On the compliance side, the use of ‘Big Data’ techniques in relation to the invoicing patterns in country-wide revenue collections is interesting to tax authorities. How are businesses progressing on the switch to digital? 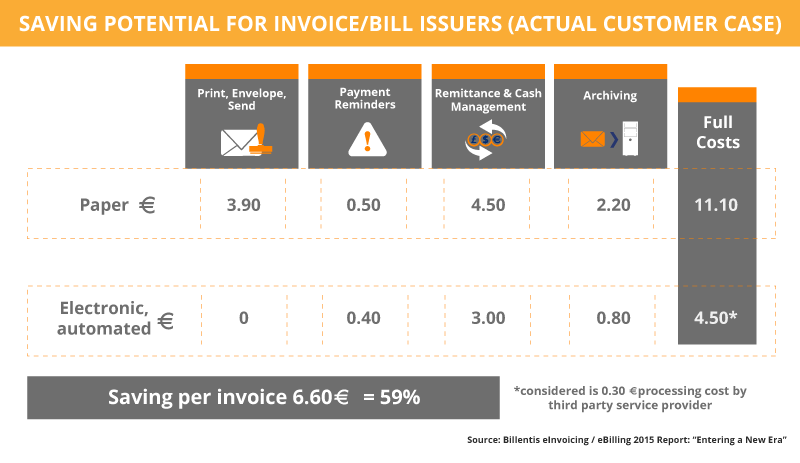 The report outlines a clear reason why many eInvoicing and eBilling projects are unsuccessful. The scope and significance of the project, with all the elements of the business that it touches, is underestimated at the start. “Once again Bruno Koch has produced a valuable report. 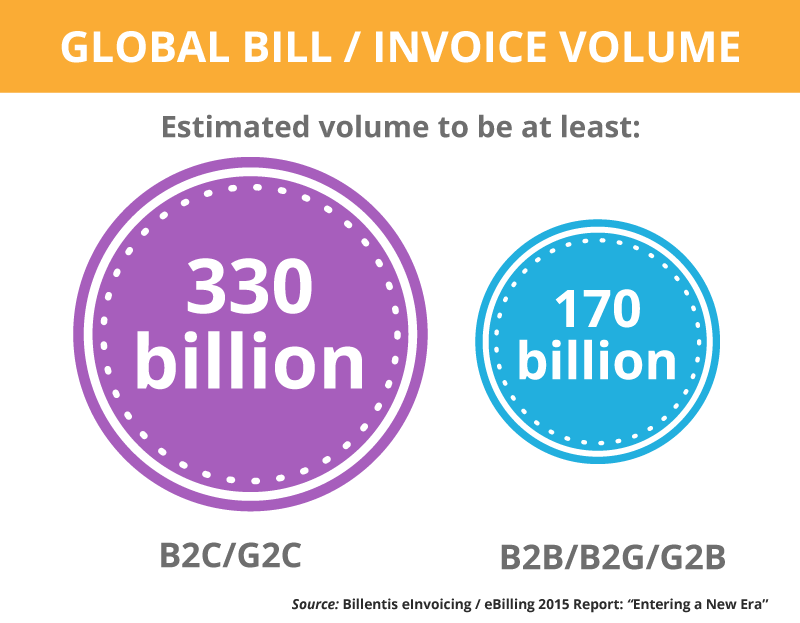 It is clear that eInvoicing and eBilling are gathering momentum around the world. The ‘fat tail’ of SME billing was always going to be the bulk of the volume when it moved across. PDF documents with embedded data looks like the clear winner in terms of meeting this requirement,”concludes Wright.